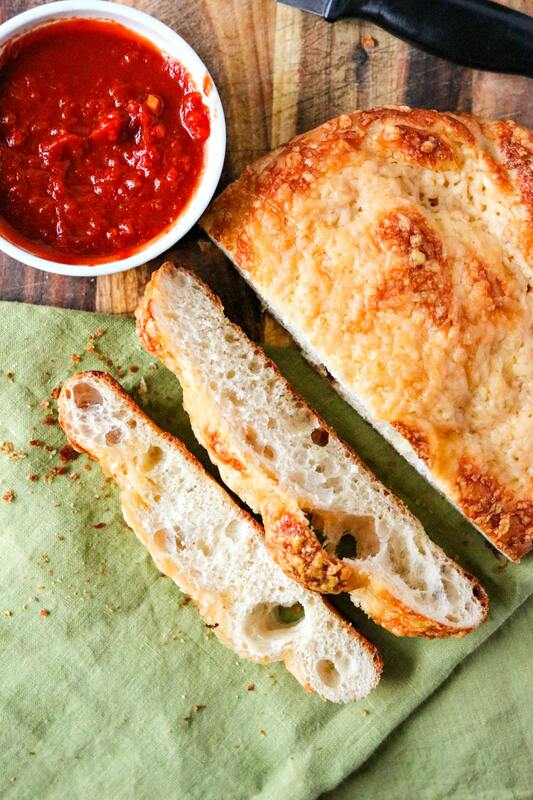 Easy Asiago Cheese Bread – This easy asiago cheese bread is made from store-bought pizza dough so it’s super simple to put together. Simply split dough in half, sprinkle freshly-shredded asiago cheese on top and bake for 15-20 minutes. That’s it! It’s the perfect accompaniment to your favorite pasta or soup. I am writing today’s post as I wait in anticipation for the Oscars Red Carpet to start in a few hours. I cannot wait to see all the glamorous looks tonight. The nominees for the acting categories tend to look the best because the designers are eager to dress them, in case they win. So I have a feeling Emma Stone, Viola Davis, Ryan Gosling, Mahershala Ali, and all the other nominated actors are going to look flawless. Okay sorry – just had to share my love of the Oscars one last time before awards season is over. On to the food! This Asiago cheese bread started as a focaccia bread. I looooove rosemary focaccia so I really wanted to create an amazing loaf of it at home. However, after two attempts, it just wasn’t going as planned. The first loaf was too dry and thin and the second, though it tasted amazing, was too complicated that I didn’t feel comfortable sharing it with you guys. So I decided to try making an easier version using store-bought pizza dough. I had leftover Asiago cheese so I decided to make one loaf with Asiago cheese and one with rosemary leaves. And the Asiago cheese loaf came out unbelievably delicious! So that’s the one I want to share with you guys. Don’t worry – I’ll keep perfecting the rosemary one and will share later on. Bread is super fun to make, but sometimes, getting the texture that you want can be difficult. So there’s no shame in taking a shortcut or too, especially if it yields incredible results. Using store-bought pizza dough is one of my favorite shortcuts because it (1) cuts out all that rise time so I can use it almost immediately and (2) tastes just as amazing as the homemade version. I get mine from my grocery store’s bakery, so your local store probably sells it too. If not, most pizzerias will sell you a ball of dough so stop by there, as well. After you’ve bought the dough, all you need to do is let it get to room-temperature, which can take about 1 hour. This makes it so much easier to work with. When the dough is cold, it’s stiff and hard to form into the shape you want. That’s important to avoid because, if you work the dough too much, it will loose all the air bubbles and become too flat. As I mentioned above, my choice to use Asaigo cheese was based on the fact that I had a wedge of it leftover. So I shredded it and sprinkled it over the prepped dough. But you can use any toppings that you want: roasted red peppers, Italian herbs and Parmesan, sun-dried tomatoes, olives – whatever you want! Asiago is a hard cheese so when you buy it from the store, the shreds will be pretty stiff, similar to shredded Parmesan. However, when you shred it yourself at home, it’s a little softer and fluffier so it has a nicer texture once it melts. Therefore, I highly recommend shredding it yourself at home, if you can. I used the grating blade on my food processor so it took SECONDS to shred. Here’s the one I have, which is super simple and affordable. Like I mentioned above, you don’t want to overwork the dough when you’re shaping it. Therefore, I recommend using your hands to shape the dough into a disk instead of forcefully forming the dough into a dish once it’s in the pan. And that’s it, folks! It’s so simple to make that I don’t need to give you many tips. Hooray! Make this bread for your next pasta night or to serve along with your favorite cup of soup! What dish are you going to enjoy with this bread? Let me know in the comments below! This easy asiago cheese bread is made from store-bought pizza dough so it's super simple to put together. Simply split dough in half, sprinkle freshly-shredded asiago cheese on top and bake for 15-20 minutes. That's it! It's the perfect accompaniment to your favorite pasta or soup. Preheat oven to 425 degrees. Grab two 8-inch cake pans and place 1 tablespoon of olive oil in each. Cut room-temperature pizza dough in half. It is much easier to work with when it's at room temperature. Working with one half at a time, shape dough into a disk using your hands. Pull on the edges of the disk to widen the disk about the size of the pan. Do not over-work the dough or else it will cause the dough to stay flat when it bakes. We want it to bubble up a bit. Place each half in pans with olive oil. Flip over to coat the other side in olive oil. Make sure dough reaches the edges of the pan. It's okay if there's a little gap; don't force the dough to the edges or else you may over-work it. Cover each dough with 1 cup of freshly shredded cheese. I purchased 8 ounces of Asiago cheese and shredded it myself with my food processor, fitted with the grating plate. Place both pans into the preheated oven and bake until the cheese begins to brown, about 15-20 minutes. Remove from oven and place on wire rack to cool for 5 minutes. Then, remove from pan and serve warm. I like to serve with marinara sauce. Yummm. I love homemade bread, but when I am short for time I never thought to pop into my local pizzeria and buy a ball of dough- GENIUS! I am totally going to try this recipe, sounds amazing!!! I love Asiago Cheese bread! I can’t wait to give this a try. Wow, this bread looks absolutely amazing and yummy! Thanks for the recipe! This looks so delicious and easy! I may have to make it for my next party! Oh My Goodness! That looks Yummy!!! Thank you for sharing! I never thought of using pizza dough to make bread before. This is a wonderful idea! I am definitely going to make this! This looks easy and simple to make. It sounds delicious and a great bread to go with many different dishes. That looks delicious! And it seems easy enough that even I could probably handle it! Thanks for sharing this! Oh man this looks crazy delicious! I will have to try and make it! Heck yes! So simple and who doesn’t love cheese and carbs?! This looks HEAVENLY! I’m such a huge fan of pasta sauce with my pizza dough. Ugh pizza/ cheesy bread is my WEAKNESS! How did you know? ! This looks delicious. Haha isn’t it everyone’s weakness?! Asiago bread is like my kryptonite! This looks so good and I cannot wait to try your recipe!